Black men are working fewer hours (down 15.7 percent) than black men in 1979, and fewer hours than white and Hispanic men now, but mostly because they have a much harder time getting into and staying in the labor market. Among prime-age men, black men were almost twice as likely to be nonearners in 2016 (21.1 percent) as in 1979 (12.8 percent). In 2016 black men were roughly twice as likely to be nonearners as white men (10.4 percent) and Hispanic men (11.1 percent). Black men with less education are particularly disconnected from the labor market. The share of black men without any college education who did not work at all in a given year began climbing in the mid-1990s, and currently, about a quarter (25.3 percent) of black men with a high school diploma and nearly 50 percent (49.1 percent) of those with less than a high school diploma are nonearners. Black women work as much as white women but lose more hours when the economy slows down. In 2016, employed white and black women worked roughly equivalent hours (1,853 and 1,845 hours, respectively). But black women lose more hours when the economy slows down. Indeed, prior to the Great Recession, employed black women worked as many as or more hours than employed white women. A majority of black women who did not work in 2016 (45.0 percent) were out of work “involuntarily” due to factors like illness, disability, or inability to find work, compared with 27.7 percent of white women. Among prime-age women, Hispanic women are by far the most likely to be nonearners. In 2016, 31.4 percent of Hispanic women were nonearners, compared with 22.2 percent of black women and 21.5 percent of white women. Hispanic women were more likely to be out of work to care for family and home (23.4 percent reported that reason for being out of work) than black women (7.9 percent) or white women (12.1 percent). When prime-age adults are able to get into the labor market, they work equally hard. One of the main reasons why prime-age adults of different racial, ethnic, and gender groups have such a wide variation in annual work hours is that some groups are much less likely to get into and stay in the workforce at all, be it by choice or other barriers. When we look at just prime-age adults who are working, there is less variation across racial and ethnic groups, both in the average number of hours worked in a given year and in changes in hours over time. Prime-age adults who typically earn the least and work the fewest hours have increased their work hours the most since 1979. From 1979 to 2016, the bottom fifth of all prime-age wage earners increased annual hours by 24.3 percent (to 1,688.5 hours), compared with 9.4 percent among the middle fifth (to 2,044.7 hours) and 3.6 percent among the top fifth (to 2,047.2 hours). For most workers then, annual earnings growth has been driven by their ability to work more hours. As our analysis will show, those who typically earn the least and work the fewest hours have actually increased their work hours the most since 1979. Unfortunately, with a fixed number of hours in a day and little control over work schedules, there are limits to how far workers can boost their annual pay by working longer hours. While patterns of increased work hours discussed in this report track closely with slow wage growth for those who remain in the labor market, there is another part of the story—the growing number of prime-age adults who have become disconnected from work. Every month the Bureau of Labor Statistics uses Current Population Survey data to calculate the share of the working-age population (age 16 and older) that is employed or looking for a job. In October 2017, this labor force participation rate was 62.7 percent, 4.6 percentage points below the high of 67.3 percent in 2000. This downward trend in labor force participation is not just a function of an aging population entering retirement. It is also apparent among prime-age adults, although the trends vary greatly between men and women. Since 1965, labor force participation for prime-age men has fallen every year, with a total decline of 8.2 percentage points as of October 2017. 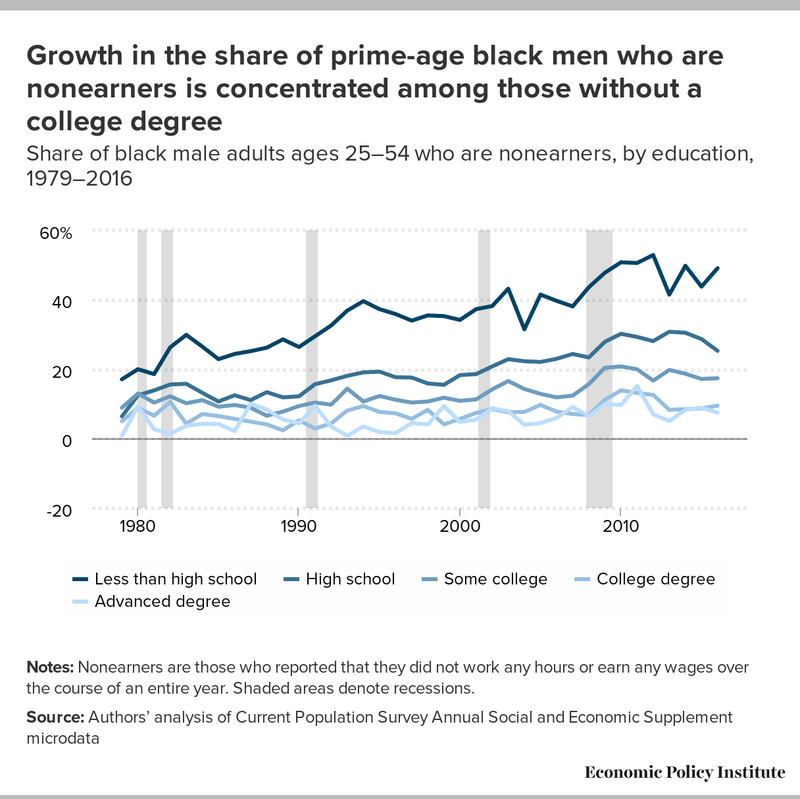 This drop for prime-age men has been particularly striking for black men and for those with no more than a high school diploma (Council of Economic Advisers 2014, 2016). Suggested reasons for the decline in labor force participation among prime-age men range from a rise in serious health conditions that are a barrier to work and the emerging opioid crisis (Krueger 2017), to technological advancements that result in younger men (under age 30) allocating less time to work and more time to leisure activities like playing video games (Aguiar et al. 2017). Labor force participation rates for prime-age women did not plateau until the late 1990s, after steady increases following World War II. However, since 2007 their participation has declined at nearly the same rate as men’s (Council of Economic Advisers 2014). This similarity in trends over the past decade would seem to argue against gender-specific causes as being most salient over this time. This report provides a detailed demographic analysis of trends in labor market disconnection and annual work hours by gender, race, ethnicity, and wage quintile in order to identify how much hours have changed for different groups of workers and the means by which those changes have occurred. Since workers would need to have earned some wages over the course of a year to be assigned to a wage quintile, the level of detail our analysis requires excludes prime-age workers who are disconnected from the labor market and do not work at all over the course of a year. In order to capture this group, we introduce a measure of labor market disconnection that differs from the BLS labor force participation rate. Specifically, we examine data on the percentage of nonearners—prime-age adults who report not working any hours or earning any wages over the course of an entire year—and impute zero hours for them in the calculation of average annual hours for all prime-age adults by race, ethnicity, and gender. We also summarize how nonearners’ reported reasons for not working vary by race, ethnicity, and gender. This sort of descriptive analysis is critical to understanding how work has changed over time, including how different groups of workers have contributed and responded to those changes by adjusting their work hours and participation. Together our dataset provides a basis to more effectively evaluate how many and what groups of workers are less than fully employed or completely disconnected from the labor market. We also present results that challenge the notion that a lack of effort or personal responsibility is to blame for low-income status and persistent racial disparities in economic outcomes. Our analysis of annual work hours is based on data from the Annual Social and Economic Supplement to the Current Population Survey (CPS ASEC). Our sample includes adults between the ages of 25 and 54, also referred to as prime-age adults. We calculate both unconditional and conditional averages of annual hours, weeks worked per year, and hours worked per week. The unconditional averages tell us how work hours have changed over time as a result of both changing hours among those who are working and changes in the share of nonearners. Nonearners are defined as those who reported zero work hours and zero wages during the previous year. The share of prime-age adults who are nonearners in a given year is used as a measure of labor market disconnection. The conditional averages focus only on the subset of adults who reported positive work hours and positive wages during the year. Since the demand for labor, and thus work hours, is cyclical, we observe trends across peak years of the business cycle (1979, 1989, 2007), the five-year period of strong economic growth during the late 1990s (1995 to 2000), and the three most recent years of the current economic recovery for which data is available (2014, 2015, and 2016). We also report data for the year before and the year after each of these dates to get a sense of near-term changes around economic peaks and how they vary for each of the demographic groups. On average, prime-age adults worked 7.8 percent more hours per year in 2016 than in 1979, but there is lots of heterogeneity in the experiences of different workers—both in hours worked per year and in changes over time—based on gender, race, ethnicity, and level of pay. Note: Nonearners are those who reported that they did not work any hours or earn any wages over the course of an entire year. The last two columns of Table 1 show whether annual work hours of given groups changed more because of a change in the number of weeks worked per year or because of a change in hours worked per week.2 The average number of weeks worked might rise as labor markets tighten and make it easier for workers to find new jobs when separations from employment occur. Average weeks worked will also rise as more people move from being out of the labor force to working. Average weekly hours might rise as a result of working more hours on an existing job, taking on multiple jobs, or as more people move from part-time to full-time employment. As lower unemployment and increased labor force participation increase the average number of weeks worked, there will also be a positive effect on the average number of hours worked per week. Since the Bureau of Labor Statistics began reporting data on multiple job holders in 1994, the percent of workers with more than one job peaked at 6.2 percent in 1995 and 1996, but has been trending downward since. Beginning in 2000, however, prime-age women have been more likely to be multiple job holders than prime-age men (Wilson 2015). Fifty-seven percent of the growth in women’s annual work hours is due to increased weeks worked, and 43 percent is due to increased hours worked per week. The increase in weeks worked per year among prime-age women is a combination of working women working more weeks and more women entering the labor force. As Table 1 shows, between 1979 and 2016, the average number of weeks worked per year among all prime-age women grew by 21.9 percent while the number of weeks worked among working women grew by 12.7 percent. During this time, hours worked per week were also increasing among all prime-age women (up 16.3 percent), as well as among the subset of women workers only (up 7.6 percent). The results are basically reversed for men. Among prime-age men, 66 percent of the decline in annual work hours is the result of men working fewer hours per week, while 34 percent of the decline is attributable to fewer weeks worked per year.3 Men’s weekly hours are declining both as a result of fewer hours among working men and as a result of the growing share of nonearners. 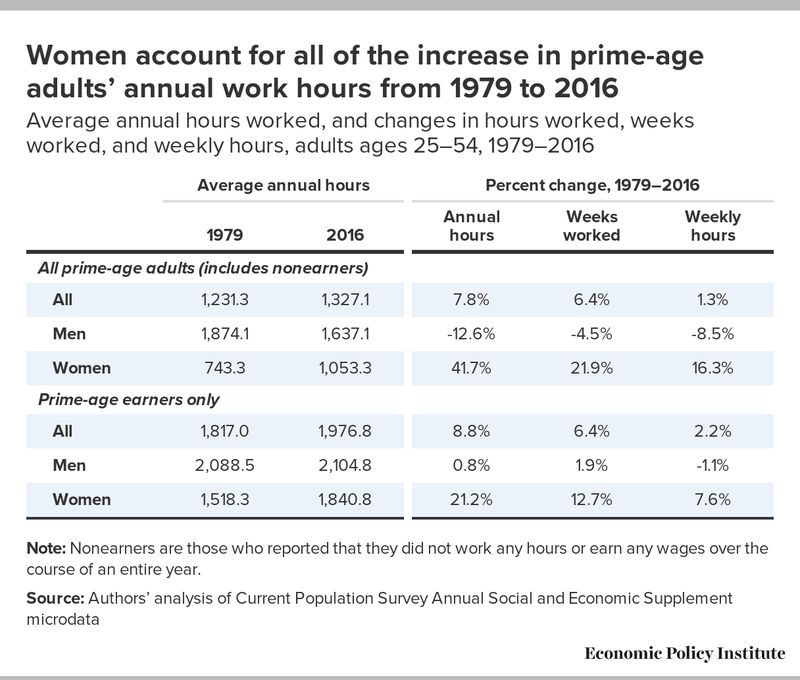 As Table 1 shows, between 1979 and 2016, men’s weekly hours declined 1.1 percent among working men only, and declined 8.5 percent among all prime-age men. Even with the decline in weekly hours, prime-age working men consistently worked an average of over 40 hours per week throughout the period we observe. While the growing number of men exiting work over this time also shows up in reduced weeks worked per year among prime-age men (down 4.5 percent), those who remain in the workforce increased the number of weeks worked in a year by 1.9 percent. The total change in annual work hours between 1979 and 2016 actually takes place in two phases with 2000 serving as a dividing line. Most of the growth in women’s work hours occurred between 1979 and 2000 while men’s work hours remained relatively flat over those years. After 2000, all groups of prime-age men and women lose ground on annual hours, but the decline among men is most pronounced. In fact, the longer term decline in prime-age men’s work hours is almost entirely a post-2000 phenomenon. Given the exceptionally tight labor market in 1999 and 2000, we might expect annual hours to peak in those years at really low levels of unemployment, and then decline in subsequent years as the unemployment rate rises. For example, the average annual unemployment rate in 2000 was 4 percent compared with 4.6 percent in 2007. After peaking at nearly 10 percent in 2010 (in the aftermath of the Great Recession), the unemployment rate had fallen to 4.9 percent by 2016 (Bureau of Labor Statistics 2017). 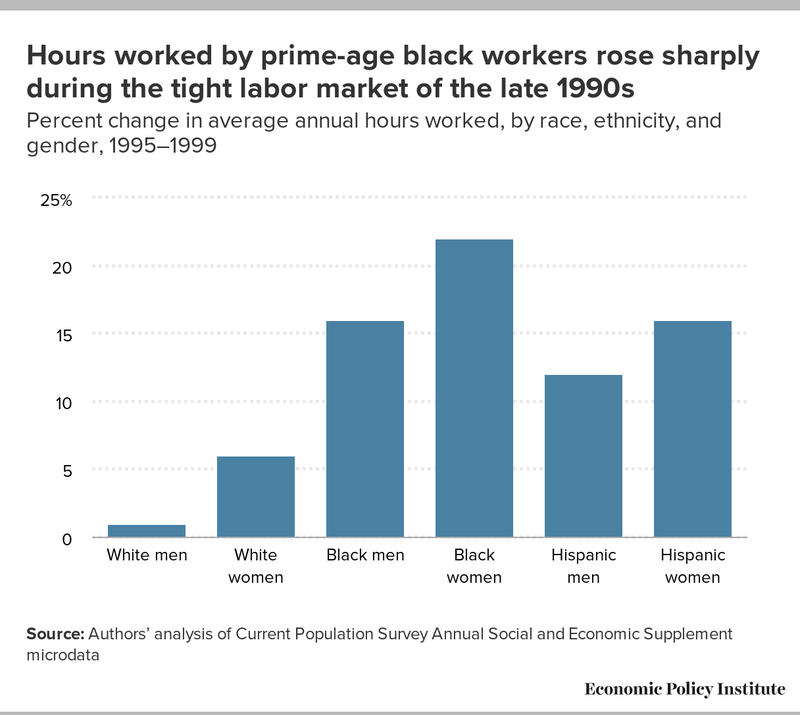 The effect of the tight labor market during the late 1990s is most apparent from the increase in hours worked by black men and women. As shown in Figure A, between 1995 and 1999, annual work hours increased 15.5 percent among black men and 22.0 percent among black women, compared with 1.3 percent among white men and 5.8 percent among white women. A more complete accounting of the relatively weaker post-2000 labor market, however, suggests that higher rates of unemployment, the sharp upward trend in the shares of prime-age nonearners, and earners working fewer hours per week all contribute to the decline in annual work hours. Earlier we presented data on the labor force participation rate, showing that the rate has dropped more for prime-age men than for prime-age women. Many observers track the employment-to-population ratio (EPOP) as another way to gauge the health of the labor market. The EPOP measures the share of the working-age population that is currently employed. 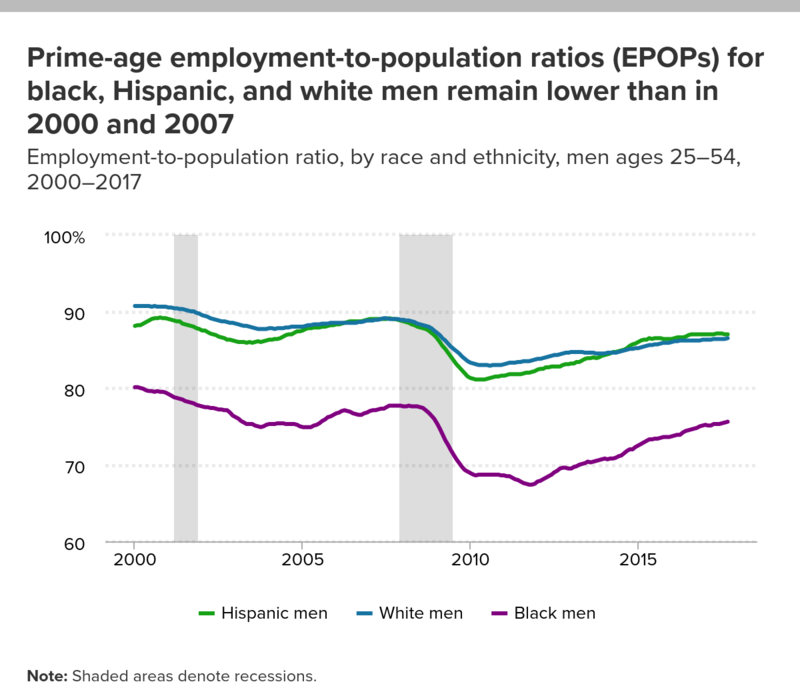 Figure B shows that prime-age EPOPs for black, Hispanic, and white men have been lower since 2000, but dropped well below recent historic norms during the Great Recession and have yet to fully recover. In addition to large differences in work hours trends by gender, there is also wide variation by race and ethnicity, both within and across genders, from 1979 to 2016. Table 2 disaggregates the data on work hours by gender, race, and ethnicity. While annual work hours increased among all groups of prime-age women between 1979 and 2016, the largest overall increase in annual hours occurred among Hispanic women (up 51.6 percent), followed by white women (up 50.8 percent), then black women (up 38.8 percent). It is important to note that one reason for the smaller increase in average annual hours among black women is that they were already working more hours per year relative to white and Hispanic women. But as we will later show, black women also lose more hours when the economy slows down. Latinas received the largest boost to annual hours resulting from increased weeks worked. This is the result of more Hispanic women entering the labor force as those who are working maintain employment for more weeks. Table 2 also shows that annual work hours declined among all groups of prime-age men, but declined most among black men (down 15.7 percent), followed by white men (down 10.5 percent), then Hispanic men (down 7.6 percent). The greater loss of hours among prime-age black men is especially troubling because unlike black women, they started with many fewer hours than prime-age white and Hispanic men. Black men are working fewer hours primarily because they are working fewer weeks (suggesting less steady employment), while Hispanic men are working fewer hours because they are losing weekly hours, suggesting less full-time employment). While all groups of prime-age men lost work hours, the losses did not eliminate the gap in annual work hours by race and ethnicity: white men still work more hours than black and Hispanic men. The bottom panel of Table 2 shows trends in work hours among just those with any employment in a given year (specifically, the subset of adults who reported positive work hours and positive wages during the year). 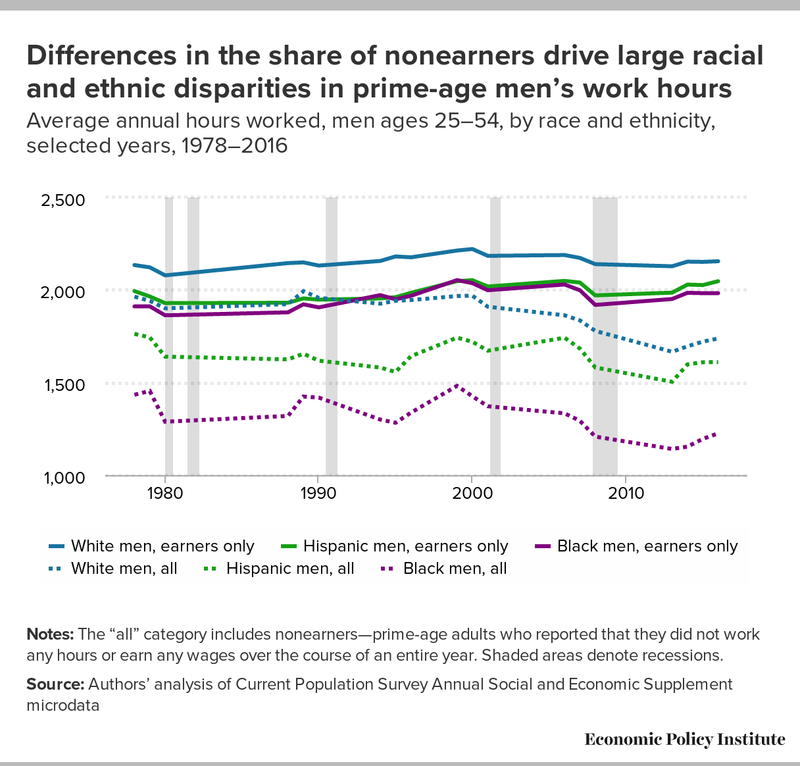 While prime-age black men in general (earners and nonearners) lost the most work hours from 1979 to 2016, among earners, African American men actually increased work hours more than white men from 1979 to 2016. In 2016, employed white men worked an average of 2,155 hours (up 1.6 percent since 1979), compared with 2,047 hours (up 4.2 percent) for employed Hispanic men and 1,983 hours (up 3.7 percent) for employed black men. These racial and ethnic differences in the average number of hours employed men work in a year are small compared with the racial and ethnic work hour differences among all prime-age men. The racial and ethnic differences among employed women are even smaller. In 2016, employed white women worked an average of 1,854 hours (up 23.2 percent), compared with 1,845 hours (up 14.1 percent) for employed black women and 1,796 (up 19.1 percent) for employed Hispanic women. Therefore, differences in labor market disconnection, rather than differences in the number of hours or how much workers changed their hours over time, play a bigger role in explaining racial and ethnic disparities in overall work hours and work hour trends among all prime-age adults. These results are illustrated in Figure C for men and Figure D for women. These graphs track annual work hours for three-year periods centered on peak business cycle years as well as the 1995–2000 economic boom. Notes: The “all” category includes nonearners—prime-age adults who reported that they did not work any hours or earn any wages over the course of an entire year. Shaded areas denote recessions. As noted in the previous section, if employed men and women of different races and ethnicities are all working similar hours, but on average, persons of different genders, races, and ethnicities are not working similar hours, then the differences among the latter groups must be attributable to labor market disconnection. This section delves more deeply into trends in labor market disconnection. Comparing Figures C and D with Figure E, we see that the timing and rate at which average annual work hours rise and fall among different groups of workers is also consistent with trends in the share of nonearners. 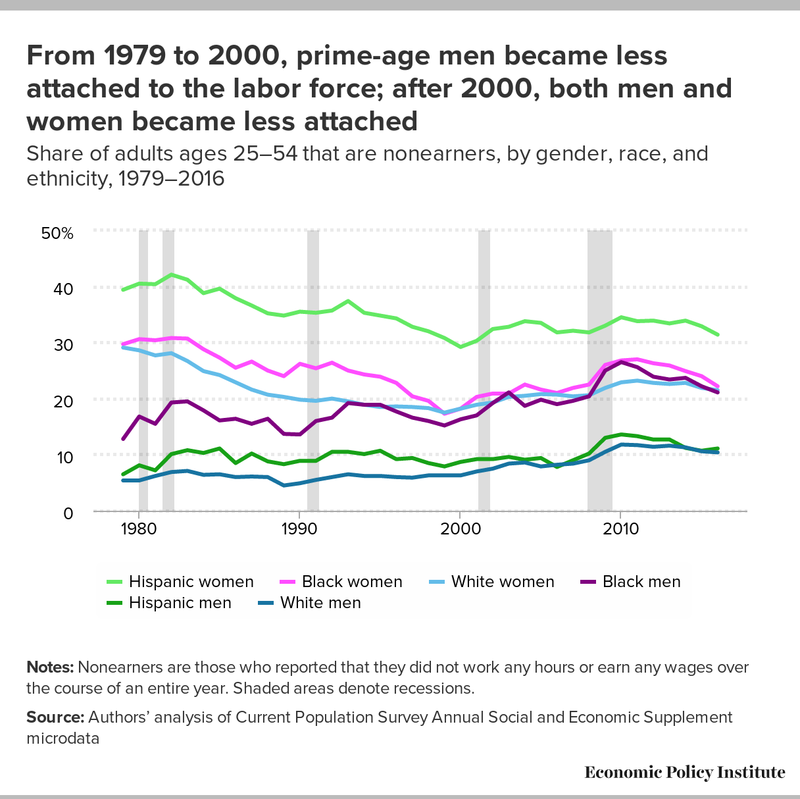 For example, the rise of annual work hours of all prime-age black, Hispanic, and white women from 1979 to 2000, as shown in the dotted lines in Figure D, is consistent with the decline in the share of prime-age women who were nonearners between 1979 and 2000. Likewise, the decline in annual work hours of all prime-age black, Hispanic, and white women after 2000 tracks the rise in the share of female nonearners after 2000, as shown in Figure E.
Notes: Nonearners are those who reported that they did not work any hours or earn any wages over the course of an entire year. Shaded areas denote recessions. As shown in Figure E, the share of prime-age women who were nonearners fell between 1979 and 2000, but rose after 2000. However the share of prime-age men who were nonearners rose gradually between 1979 and 2000, and then rose notably faster after 2000, especially among black men. Figure E also shows that for both genders (though less so for white women), the share of nonearners grew rapidly between 2007 and 2010, the years immediately following the Great Recession, and has slowly fallen since. While the work hours trends and labor market disconnection for black and white women in Figures D and E follow similar trends, the greater cyclicality of work hours and labor market disconnection among African American women (which also afflicts African American men) contributed to less overall growth in annual work hours of all prime-age black women between 1979 and 2016 as seen in Table 2. 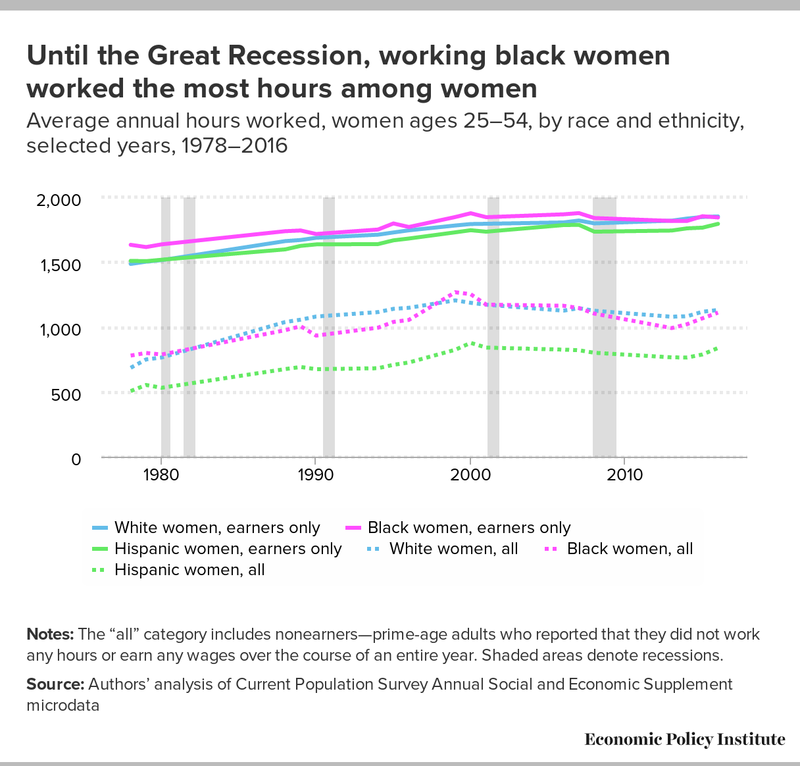 This can also be seen in Figure D: while the increase in work hours for white women follows a smoother upward path, for black women, there are clearly more “bumps” in the series as periods of increased hours are followed by a noticeable loss of work hours before rising again. The growing number of prime-age men who have become disconnected from the labor force, not working at all over the course of an entire year, is a major contributor to the downward trend in average annual hours worked among all prime-age men. For the three groups of men shown in Figure E, the share of nonearners rose gradually between 1979 and 2000, but notably faster after 2000. This growth in the share of prime-age men who were nonearners shown in Figure E is consistent with the sharp decline in annual hours of all men (not earners only) after 2000, as shown in Figure C. This is especially true for prime-age black men. Figure E also shows that rates of labor market disconnection within genders varies by race and ethnicity, and these differences have generally persisted over time. Hispanic women are by far most likely to be nonearners. Black men are consistently more likely to be nonearners than their white and Hispanic counterparts, but this gap began widening after 1999. While labor market disconnection among prime-age white and Hispanic men never gets anywhere near the rates for women, the share of black men who are nonearners rose to levels more consistent with the shares of black and white women beginning in 1993. As a result, the number of average annual hours worked by prime-age black men is much lower than the average hours worked by prime-age white and Hispanic men, as shown earlier in Figure C. Figure D illustrates that the same is true for prime-age Hispanic women compared with white and black women. The rise of mass incarceration among this particular demographic is surely an important influence on growing labor market disconnection among black men, but it is difficult to precisely estimate the effect with the available data.5 Estimates suggest that mass incarceration and related felony convictions have reduced employment rates for men nationally by nearly 2 percentage points, with reductions of 2.7 to 6.9 percentage points for men without a high school diploma and reductions of 2.3 to 5.3 percentage points for African American men (Schmitt and Warner 2011). Even one year after being released from prison or jail, nearly 60 percent of people with criminal records are not employed in the formal labor market (Petersilia 2000). In fact, Pager and Western (2009) show that being black reduces the chances that a job applicant with a criminal record is called back for another interview or offered a job by almost 50 percent relative to white job applicants. In addition to different rates of labor market disconnection, prime-age black, white, and Hispanic men and women also give different reasons for not working over the course of an entire year. Figures G–L show for each racial/ethnic and gender group the share that are working and, if they are not working, the share who cite a given reason for not working. For a closer examination of the data for not working, users can click on the “Working” box under each graph to temporarily remove the working population from the graph. 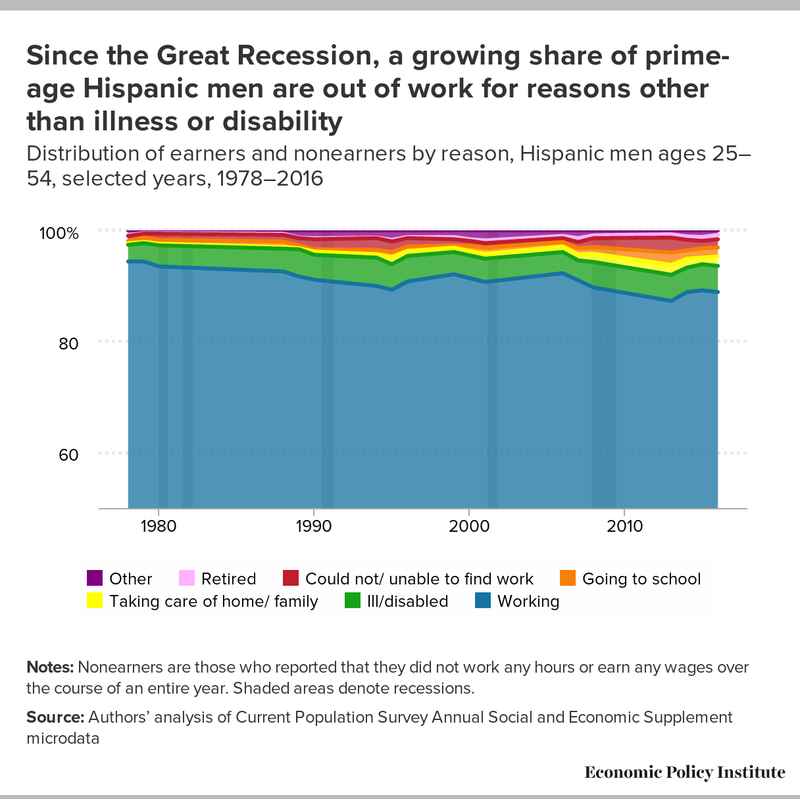 Among all groups of prime-age men (Figures G–I), the most commonly reported reason for being out of work is illness or disability and this accounts for a growing percentage of all groups of prime-age men over time. For black men, the second most commonly reported reason for being out of work was that they were unable to find work. By contrast, the second most common reason white men report for not working is going to school, and the second most common reason Hispanic men report for not working is taking care of family. Assuming that illness or disability, or inability to find work, are circumstances largely out of an individual’s control, men who cite these two reasons can be said to be out of work involuntarily. In 2016, more than two-thirds (68.3 percent) of prime-age black men who did not work at all were out of work involuntarily, compared with 59.1 percent of nonworking white men and 55.8 percent of nonworking Hispanic men. Among all prime-age women (Figures J–L), Hispanic (23.4 percent) and white (12.1 percent) women most commonly reported taking care of home or family as the reason they were not working in 2016, compared with just 7.9 percent of black women. 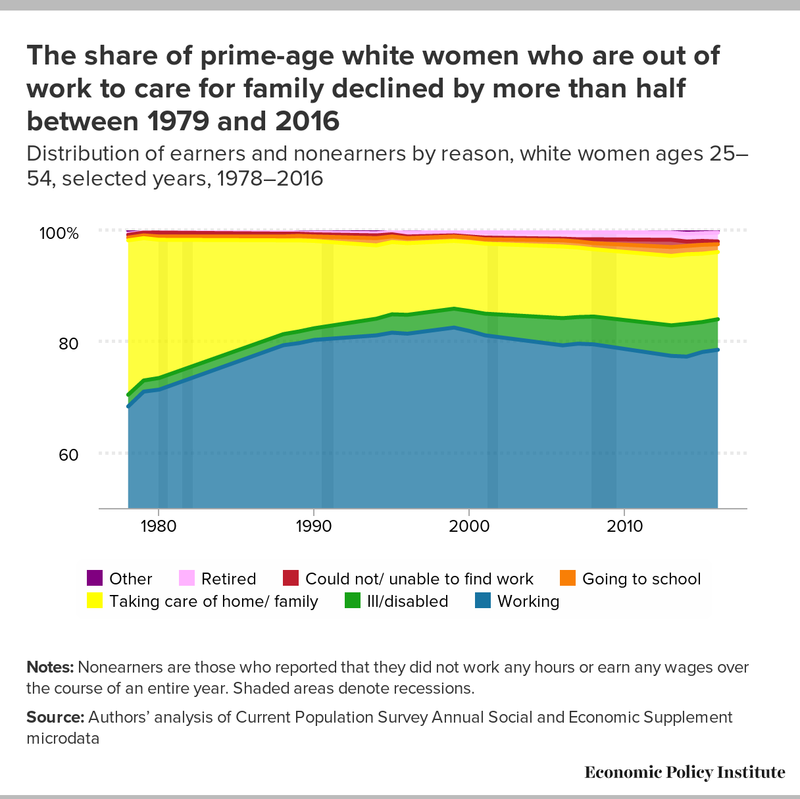 While caring for home or family remains the most common reason white women don’t work, the shares of white and black women who are out of work to care for children declined by more than half between 1979 and 2016. As more prime-age women have entered the workforce, a growing share report illness or disability as their main reason for not working. 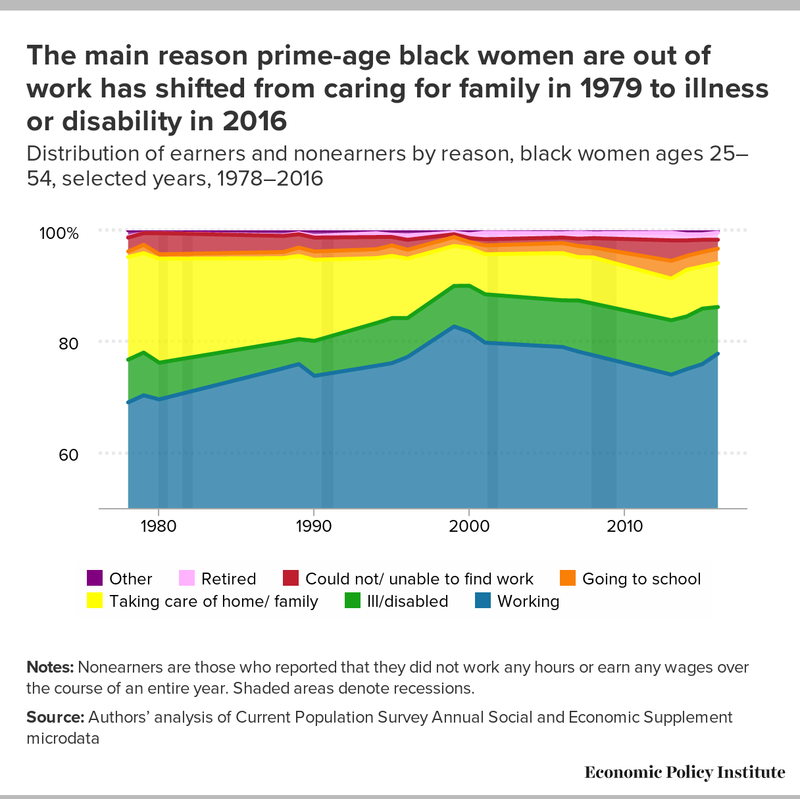 In 2016, most black women who didn’t work reported illness or disability as the reason, accounting for 8.4 percent of all prime-age black women, up from 7.7 percent in 1979. Nearly a majority of black women who did not work in 2016 (45.0 percent) were out of work “involuntarily” due to factors like illness or disability or the inability to find work, while this is less so the case among Hispanic (14.8 percent) and white (27.7 percent) women who did not work. Given the high cost of childcare, caring for children may be more of a constraint rather than a pure choice for some women, and could also be considered an involuntary absence from work. Therefore, although there is a significant amount of variation in the reasons black, white, and Hispanic women report for not working, there may be less of a difference across groups in terms of being out of work “involuntarily,” but we are not able to directly observe this from the data. There is some evidence that the reasons for labor market disconnection have changed for some groups since 2000. For example, as more prime-age black men become nonearners after 2000, the share out of work due to illness or disability barely changes (see Figure H). Instead, there is more growth in men reporting other reasons for being out of work, including taking care of family, going to school, and an inability to find work, especially after 2007. In 1999, only 1 percent of all prime-age black men reported inability to find a job as their reason for not working, compared with more than four times that in 2008 and later years. The post–Great Recession increase in the share of black men reporting that they are disconnected from the labor force because they can’t find a job is consistent with basic monthly Current Population Survey data showing an increase in the share of men working part time for economic reasons (someone working part time for economic reasons is someone who wants and is available for full-time work but is only working part time). This share has also grown since 2000, particularly among black and Hispanic men. In 2016, one in four black and Hispanic men working part time was doing so for economic reasons (25.1 and 26.5 percent, respectively), much higher than the share of white men (14.8 percent). These percentages are well above the numbers for each group in 2000, when only 12.6 percent of black men, 15.9 percent of Hispanic men, and 5.9 percent of white men reported working part time for economic reasons. While this may be related to structural changes in the types of jobs available (Golden 2016), the bottom line is that these men would likely be working more hours if more were available. In the last section we showed that changing rates of labor market disconnection among prime-age adults had a major influence on disparate trends in overall average annual work hours by gender, race, and ethnicity. When we consider employed, wage-earning men and women of different races and ethnicities, work hours are more similar. In this section, we focus on the set of wage earners to further disaggregate trends in annual work hours by wage quintile. Our analysis of the wage distribution of workers in our data shows that in 2016, 49.5 percent of black men and 53.2 percent of Hispanic men were among the bottom 40 percent of male wage earners, compared with just 29.9 percent of white men. The bottom 40 percent of female earners includes 40.2 percent of black women, and 48.6 percent of Hispanic women, but just 27.8 percent of white women. Overall, trends for the bottom 40 percent explain the experiences of more than half of black (54 percent) and Hispanic (57.2 percent) workers, compared with 40.1 percent of white workers. 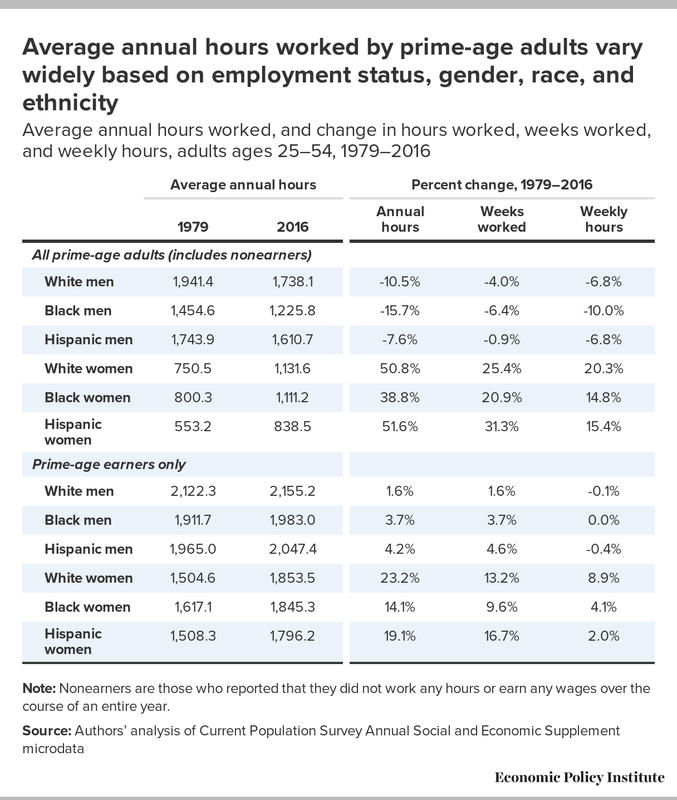 Table 3 reports average annual work hours as well as the percent change in annual hours, weeks worked, and weekly hours between 1979 and 2016 by wage quintile, gender, race, and ethnicity. While there are some exceptions, these results can generally be summarized by the fact that most of the growth in work hours occurred among the lowest earners who also worked relatively fewer hours than higher-wage earners. In other words, groups with the most growth in annual work hours were those working less than full-time full-year, or less than 2,000 hours per year. As we climb the pay ladder, the increase in work hours diminishes. For example, as shown in Panel A of Table 3, the bottom fifth of all prime-age wage earners increased annual hours by 24.3 percent, compared with 9.4 percent among the middle fifth and 3.6 percent among the top fifth. Our analysis of the underlying data for Table 3 tells us that at least two-thirds of the increase in annual hours among low- and middle-wage earners was the result of increased weeks worked as opposed to more weekly hours, suggesting that these workers are maintaining employment for more weeks. On the other hand, half of the increase for high-wage earners was due to increased weekly hours and the other half was due to increased weeks worked. Notes: Earners includes all adults ages 25–54 who reported any hours worked or any wages earned during the reporting year. The wage quintiles in this table reflect the earnings distribution by gender. For example, white, black, and Latino men are placed in the wage quintiles based on their distribution in the population of male earners as a whole, not in wage quintiles based only on white men, only black men, and only Latino men. The average changes in annual work hours across wage quintiles mask distinct patterns that vary by gender, race, and ethnicity. Although all groups of women in the bottom fifth increased annual work hours by more than higher earning women, the growth in work hours was most skewed among black women. As shown in Panel B of Table 3, black women’s annual work hours grew 22.3 percent in the bottom fifth, but only 4.3 percent in the top fifth. By comparison, white women’s work hours increased 36.6 percent in the bottom fifth and 19.4 percent in the top fifth, and Hispanic women saw an increase of 31.3 percent in the bottom fifth and 17.0 percent in the top fifth. While higher earning black women experienced much less growth in weekly hours than whites or Latinas, they started out working more hours in 1979—a pattern that holds across every wage quintile. For example, black women in the top fifth of female earners worked an average of 1,770 annual hours in 1979, compared to 1,593 annual hours for white women and 1,551 annual hours for Hispanic women in the top fifth. 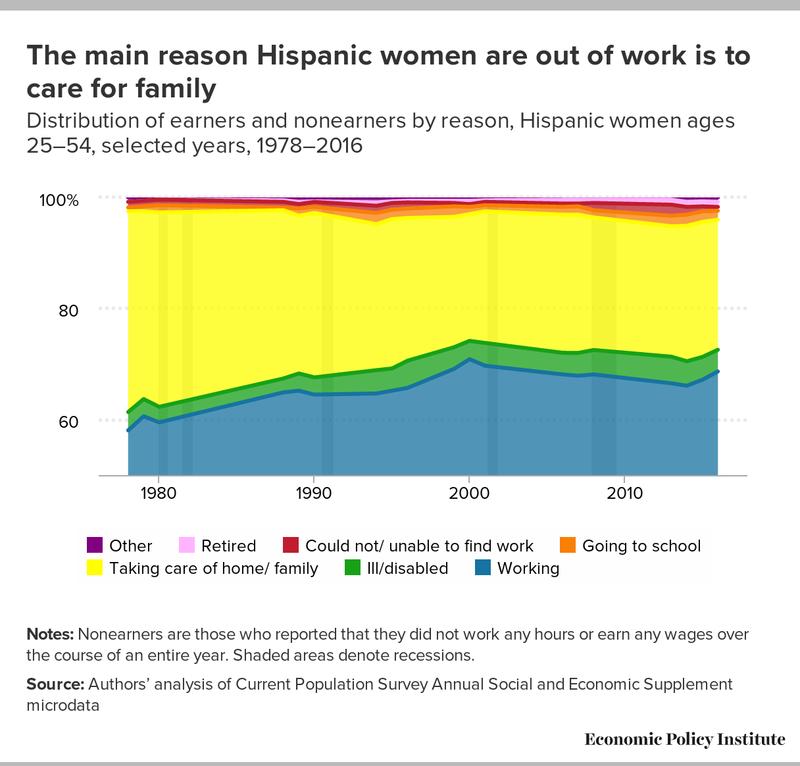 Among the middle fifth of female earners, Hispanic women (14.9 percent) increased annual hours less than white (23.6 percent) or black (16.1 percent) middle-wage earners from 1979 to 2016. Black and Hispanic women in all wage quintiles increased annual hours primarily by working more weeks per year, as did white women in the bottom and second fifths of female wage earners, while white women in the middle through top fifths increased annual hours with a more even mix of increased weeks and increased weekly hours at similar rates. Men’s annual work hours also changed from 1979 to 2016 but on a smaller scale than did women’s work hours, and with more growth among high-earning white men and less growth among high-earning black and Hispanic men, as shown in Panel C of Table 3. For whites, the highest male earners experienced the most growth in annual hours, while the middle fifth of black men and the bottom fifth of Hispanic men increased hours the most within those respective groups. 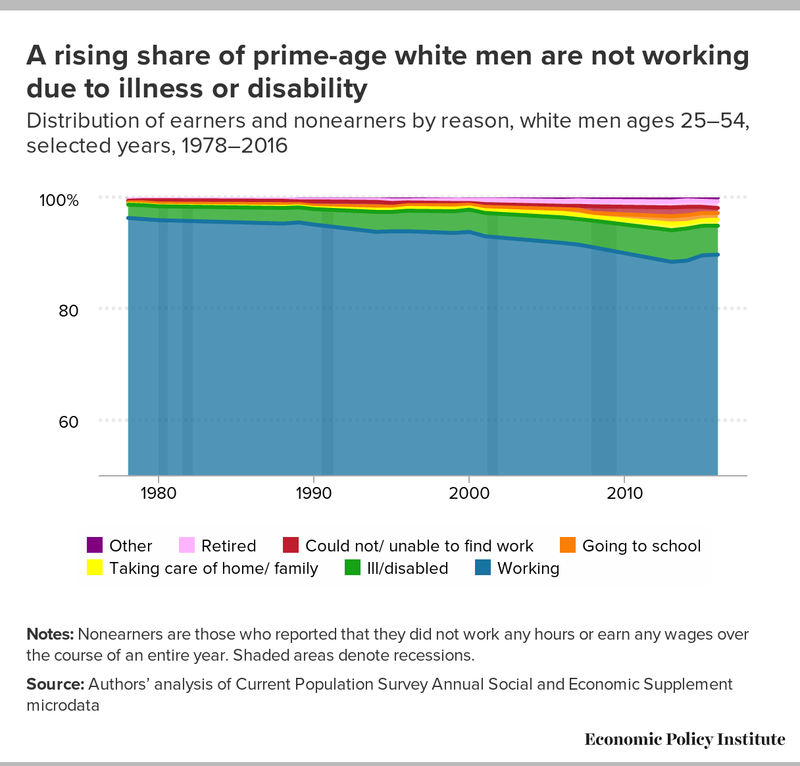 For example, the bottom fifth of prime-age white men lost hours (down 3.1 percent) between 1979 and 2016 while average annual work hours increased 4.2 percent in the top fifth. This is in contrast with an increase of 4.1 percent among black men in the bottom fifth, 4.5 percent in the middle fifth and 3.1 percent in the top fifth. Work hours of Hispanic men grew more among the lowest earners than the highest earners, by 7.6 percent and 4.9 percent, respectively. Growth in annual work hours of the middle fifth of white men (2.3 percent) and Hispanic men (1.1 percent) was notably lower than growth in annual work hours of middle-wage black men (4.5 percent). All low-wage-earning men worked fewer hours per week in 2016 than in 1979. Black and Hispanic men compensated for the decline in weekly hours by increasing the number of weeks worked per year enough to result in a net gain in annual hours worked. Low-wage white men also increased weeks worked, but not enough to compensate for the loss in weekly hours. Middle-wage Hispanic men also lost weekly hours over this time and increased annual hours entirely by increasing weeks worked. Middle-wage black men increased annual hours mainly by working more weeks (73 percent of the total increase in annual hours). Among the highest earners, increased weekly hours accounted for the majority of increased annual hours for white (87 percent) and Hispanic (86 percent) men. For black men in the top fifth of male earners, an increase in weekly hours more than offset a slight decline in weeks worked. In our earlier discussion, we focused on the change in annual work hours between 1979 and 2016 and how the magnitude and direction of that change varied by race, ethnicity, gender, and wage quintile. Here, we discuss whether these changes had any effect on the number of hours worked in a given year by one group relative to another. While groups that started out with fewer hours typically increased annual work hours by more than those who started with more hours, in most cases, this did not eliminate the relative differences in the number of hours worked. In other words, groups that started out with fewer hours were not able to close the “hours gap” by working more hours. For example, in almost every wage quintile, white men consistently work more hours than black and Hispanic men. The one exception in our data is in the bottom quintile of men where Hispanic men went from working fewer hours than white men in 1979 to more hours by 2016. Given the overrepresentation of black and Hispanic workers among lower earners, these relative differences in the number of annual hours worked annually by race, ethnicity, and wage quintile also help us to better understand average differences in annual work hours by race and ethnicity alone. In other words, we may be seeing certain patterns among black and Hispanic men that are a function of the fact that black and Hispanic male workers are more likely to be low-wage workers. Therefore, racial and ethnic disparities in average annual work hours among prime-age male wage earners result both from the overrepresentation of black and Hispanic men among lower-wage earners (who typically work fewer hours) and the fact that white men work more hours than black men and Hispanic men at nearly every level of pay. Black and Hispanic women are also overrepresented among low-wage-earning women, but racial and ethnic disparities in work hours among prime-age women are much smaller than among prime-age men and tend to favor black women. One reason that black women work similar or more hours on average as white women, in spite of being overrepresented among lower-wage workers (who work fewer hours than higher-wage workers), is because lower-wage black women work more hours than their white female counterparts. In fact, in 2016, average annual work hours for black and Hispanic women in the bottom 40 percent of female earners were higher than those of white women in the bottom 40 percent. As with working in the formal labor market, caring for home and family requires a large commitment of time. Working parents, in particular, must make important decisions about the tradeoffs between time spent working outside of the home and time spent on care responsibilities. The persistence of gender differences in annual work hours is a reflection of the gender norms that influence how women and men allocate their time differently between the labor market and care responsibilities. These decisions are also influenced by economic circumstances that vary by race and ethnicity. Although women increased work hours by more than men from 1979 to 2016, thus narrowing gender differences in work hours, prime-age women continue to work fewer hours than prime-age men. Over time, as women’s labor force participation has increased, gender differences in annual hours have become more a function of women working fewer hours per week than men and less a function of women working fewer weeks per year. These gender differences in annual hours worked are evident for each of the racial and ethnic groups and for every wage quintile. The smallest gender difference in annual hours worked is between black men and black women and reflects the fact that black men work fewer hours on average than white or Hispanic men, while black women work about as many hours as white women and more than Hispanic women. Given the large share of prime-age women who reported not working because of home and family responsibilities in 2016, it seems plausible that care responsibilities could also affect gender differences in work hours among prime-age earners. A comparison of gender differences in annual work hours of adult earners without children with gender differences in annual work hours of earners who are parents (married or single) supports this explanation. Parents are identified in the data based on having children of their own in the household. While the category of adults without children could also include parents who don’t live with their children, our comparison is concerned with how having the primary responsibility of caring for children affects work hours. We find that among wage earners, the work hours of men and women are in fact most similar among adults without children. As shown in Table 4, on average, in 2016 prime-age male earners without children worked 5.8 percent more hours per week than prime-age female earners without children. The difference for single parents was 12.0 percent while married prime-age fathers worked 21.2 percent more hours per week than married prime-age mothers. Among the wage earners represented in this table, married fathers by far work the most hours per year relative to other men, while women without children work more hours than mothers. Taken together, these patterns show that responsibilities for child care limit the number of hours worked by custodial parents, but disproportionately so among women. Single fathers work fewer hours than married fathers who have a spouse to assist with child care and men who have no child care responsibilities. However, working mothers, regardless of marital status, work fewer hours than women with no child care responsibilities. Notes: Gender gaps are calculated as 1 minus the ratio of women’s hours to men’s hours. All race- and ethnicity-specific gender gaps are relative to men of the same race/ethnicity. “Children” refers to a person’s own children under the age of 18 who live in the household. Gender differences among single parents and adults without children are smaller than gender gaps among married parents for all racial and ethnic groups. 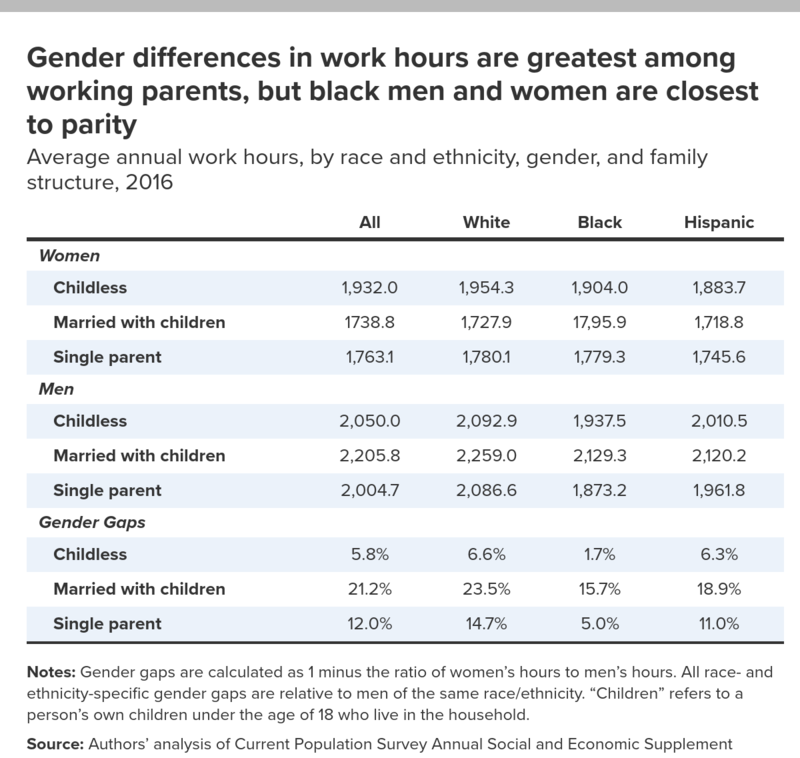 Among married parents, the work hours of black men and women are most similar. For example, as shown in Table 4, married white fathers work 23.5 percent more hours per year than married white mothers, but the gaps for married black and Hispanic parents are just 15.7 percent and 18.9 percent, respectively. The relatively smaller gender difference in hours worked by married black parents reflects the fact that married black mothers work more hours than any other group of working mothers (married or single), but also the fact that married black fathers work many fewer hours than married white fathers. Given that black workers persistently earn less than whites, when both parents are working, black women may feel they have less flexibility in reducing hours because they need to sustain their contribution to the financial needs of the family. Married Hispanic fathers and mothers both work fewer hours than their married black and white counterparts. As shown in Table 3, if we compare the difference in hours worked between men and women in the bottom fifth to the difference in the top fifth, gender differences in average annual work hours are smaller among higher-wage workers. This suggests that higher earning women are more likely to work in jobs that have similar hours to higher earning men, and these higher paying jobs also provide more financial resources to hire caregivers rather than reduce work hours to meet family care responsibilities. The analyses presented in this report depict a divided workforce, with different classes of workers: Those who are consistently working full time and earning wages at or above the median; those who earn below the median and are working more than they used to—when they can get jobs—but are still working less than full time; and those who face barriers that keep them out of the workforce full time. The lowest earners, who were working the least hours in 1979, increased their work hours more than higher-wage earners from 1979 to 2016. Low- and middle-wage earners are working more annual hours primarily because they are getting into and staying in the labor force for longer during a given year. But they still don’t get as many hours as high-wage earners. Black and Hispanic workers are overrepresented among these low- and middle-wage earners (the shares of black and Hispanic workers in the low-to middle-wage categories are greater than their shares of the workforce overall). Once black men get into the labor market, the number of hours they work each year is closer to their white and Hispanic peers than overall averages would suggest. Prior to the most recent recession and subsequent recovery, employed black women worked as many hours as employed white women or more. Black men are more likely [than white and Hispanic men] to be out of the labor force (21.1 percent of black prime-age men were “nonearners” in 2016), but the majority (68.3 percent) of nonworking prime-age black men are out of work involuntarily—due to illness, disability, or inability to find work—as are a majority of nonworking white (59.1 percent) and Hispanic (55.8 percent) men. A majority of black women who did not work in 2016 (45.0 percent) were out of work “involuntarily” due to factors like illness, disability, or inability to find work, while this is less so the case among Hispanic (14.8 percent) and white (27.7 percent) women who did not work. In 2016, one in four black men and one in four Hispanic men working part time was doing so involuntarily, i.e., because of economic reasons (25.1 and 26.5 percent, respectively). In comparison only 14.8 percent of white men were stuck working part time when they would rather be working full time. Whereas married white fathers work 23.5 percent more hours per year than married white mothers, married black fathers work just 15.7 percent more than married black mothers. This smaller gender gap for married black parents suggests that married black women with children may have less flexibility in reducing hours given the expense of caring for a family and the higher rates of unemployment and lower hourly wages of black men and women. While American workers are united around the desire to secure a comfortable standard of living for themselves and their families through work, opportunities to do so are not universally available. This report highlights trends in annual work hours among prime-age workers between 1979 and 2016, and it shows that those opportunities have become fractured along the lines of gender, race, and class (as measured by wage quintile). As wage inequality has grown over the last four decades, we observe two very different responses when it comes to work hours. On one hand, workers are working many more hours a year, perhaps in part to compensate for tepid, and in some instances declining, hourly wage growth. On the other hand, a growing number of workers have become disconnected from the labor force, which we measure as not working at all over the course of an entire year. This is true even among prime-age workers who we expect to have a high degree of attachment to the labor market. Our results also point to ways in which social and economic policy have contributed to this bifurcation by lowering barriers to employment for some while increasing barriers for others. For example, the rise in prime-age women’s labor force participation since 1979 stands in direct contrast to the decline in labor force participation among prime-age men, particularly among African American men with a high school diploma or less. Together these data provide a basis to more effectively evaluate how many and what groups of workers are less than fully employed or completely disconnected from the labor market and for what reasons. The data in this report also challenges the notion that a lack of effort or personal responsibility is to blame for low-income status and persistent racial disparities in earnings. The fact that African Americans quickly boosted their work hours when unemployment fell (known in economics terms as an “elastic response” to falling unemployment), particularly in the late 1990s, shows that boosting economic opportunities will draw in many willing and able workers. Instead of lecturing to workers being failed by the economy, policymakers need to chart a new policy direction that addresses current economic and social realities in a way that allows all workers to make optimal choices about how they spend their time. Janelle Jones is an economic analyst for the Economic Policy Institute and works on a variety of labor market topics within EPI’s Program on Race, Ethnicity, and the Economy and the Economic Analysis and Research Network (EARN). She was previously a research associate at the Center for Economic and Policy Research (CEPR), where she worked on topics including racial inequality, unemployment, job quality, and unions. Her research has been cited in The New Yorker, The Economist, Harper’s, The Washington Post, The Review of Black Political Economy, and other publications. She also worked as an economist at the Bureau of Economic Analysis. She has an M.A. in applied economics from Illinois State University. 1. Average annual earnings data in this paragraph are from the authors’ calculations based on analysis of Current Population Survey Annual Social and Economic Supplement microdata. Average annual earnings calculated as the product of average annual hours worked times the real average hourly wage. Wages deflated by the Consumer Price Index for all Urban Consumers Research Series (CPI-U-RS). 2. In order to perform this decomposition we calculate annual hours as the product of average annual weeks worked and average hours worked per week, rather than use the reported measure of annual hours worked in the CPS ASEC data. 3. This could be related to a shift from industries or occupations with longer work weeks, or a general shift to shorter work weeks across all industries or occupations. In a forthcoming report, we plan to explore patterns in average annual hours by industry and occupation and how these patterns contribute to the trends in hours worked across different demographic groups observed in this report. 4. EPI analysis of Current Population Survey Outgoing Rotation Group data. 5. The CPS data are likely overstating male, and especially black male, employment rates in a given year and understating the decline over time. First, mass incarceration masks part of the increase in non-employment for men, especially black men, because the CPS excludes the prison and jail population. Second, undercounting of non-employed men, especially young men, and black men in the CPS—and independent of the mechanical issue of the institutionalized population—may lead the CPS to overstate male, young male, and black male employment rates. What is more this bias appears to be getting worse over time (Schmitt and Baker, 2006a and 2006b). 6. For example, this means that white, black, and Latino men are placed in the wage quintiles based on the population of male earners as a whole, not in the wage quintiles based on only white men, only black men, and only Latino men. Aguiar, Mark, Mark Bils, Kerwin Kofi Charles, and Erik Hurst. 2017. “Leisure Luxuries and the Labor Supply of Young Men.” NBER Working Paper 23552: 37-42. Bivens, Josh, and Lawrence Mishel. 2015. Understanding the Historic Divergence between Productivity and a Typical Worker’s Pay: Why It Matters and Why It’s Real. Economic Policy Institute report. Bureau of Labor Statistics. 2017. Labor Force Statistics from the Current Population Survey, Series ID LNS14000000. Accessed February 2017. Council of Economic Advisers. 2014. The Labor Force Participation Rate since 2007: Causes and Policy Implications. Executive Office of the President of the United States. Council of Economic Advisers. 2016. The Long-Term Decline in Prime-Age Male Labor Force Participation. Executive Office of the President of the United States. Current Population Survey Annual Social and Economic Supplement microdata. Various years. Survey conducted by the Bureau of the Census for the Bureau of Labor Statistics [machine-readable microdata file]. Washington, DC: U.S. Census Bureau. Current Population Survey basic monthly microdata. Various years. Survey conducted by the Bureau of the Census for the Bureau of Labor Statistics [machine-readable microdata file]. http://www.bls.census.gov/ftp/cps_ftp.html#cpsbasic. Golden, Lonnie. 2016. Still Falling Short on Hours and Pay: Part-Time Work Becoming New Normal. Economic Policy Institute. Krueger, Alan. 2017. Where Have All the Workers Gone? An Inquiry into the Decline of the U.S. Labor Force Participation Rate. Brookings Institution. Pager, Devah, and Bruce Western. 2009. Investigating Prisoner Reentry: The Impact of Conviction Status on the Employment Prospects of Young Men. National Criminal Justice Reference Service. Petersilia, Joan. 2000. “When Prisoners Return to the Community: Political, Economic and Social Consequences.” Sentencing & Corrections no. 9, November. Schmitt, John, and Dean Baker. 2006a. Missing Inaction: Evidence of Undercounting of Non-Workers in the Current Population Survey. Center for Economic and Policy Research. Schmitt, John, and Dean Baker. 2006b. The Impact of Undercounting in the Current Population Survey. Center for Economic and Policy Research. Schmitt, John, and Kris Warner. 2011. “Ex-offenders and the Labor Market.” Working USA: The Journal of Labor and Society vol. 14, no. 1, 98–99. Wilson, Valerie. 2015. “Women Are More Likely to Work Multiple Jobs than Men.” Economic Snapshot, Economic Policy Institute.